Monday was my birthday party, Tuesday was drinks with Pieter (the gay farmer from Augrabies), Wednesday was my actual birthday and dinner with the folks, which left thursday and friday night to essentially pack up my entire life into boxes. Which we did. 45 boxes to be exact, plus a crapload of furniture. So on saturday morning my moving guys arrived and started hauling. 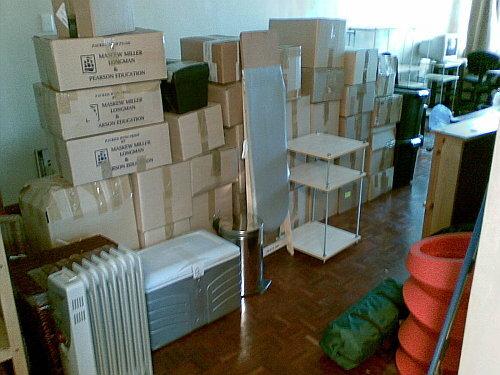 I decided a few years ago that moving my own stuff is out of the question since it would require days and days of moving in my car, and, even if I could hire a bakkie, I would hate to have to carry a couch down 5 flights of stairs, and still take a ridiculous number of trips to get the job done. So we spent the rest of Saturday sorting through stuff and packing cupboards. Sunday was our domestic day; we went shopping for drill bits, I fixed the toilet seat, went to fruit and veg city and made strawberry jam (from scratch). Oh, and we made an awesome curry for supper that is also going to be tonight’s supper.